You've joined the industry leaders and built a great rewards program. Now what? 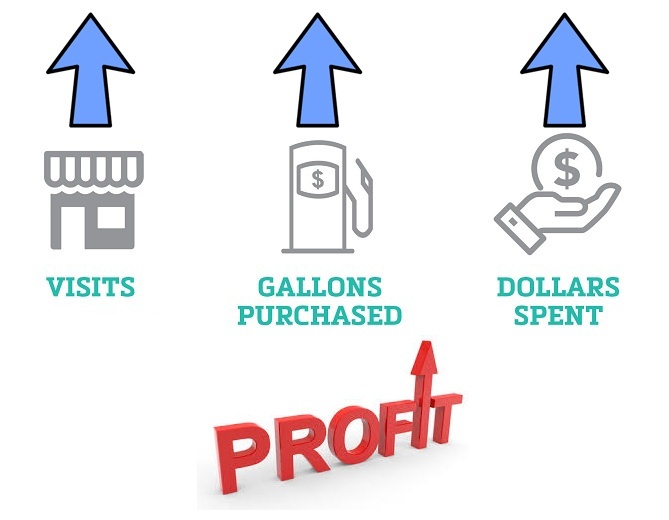 Here are 5 ways to improve your rewards program and increase visits and sales for your c-store. Too often, businesses over-spend on communications and advertising without taking advantage of their best asset: customers. Creating a positive experience at every point of contact - a simple thank you for being a rewards member, providing an unexpected offer, discount or gift, and a heartfelt personal acknowledgment for their patronage - will get you ten times better return on investment than a program flyer lost on your counter. I recommend to all of my clients a well laid out, launch program that includes a word-of-mouth campaign that is integrated into their rewards program plan. It’s easy and mostly free! Keep the sign up process and rewards structure easy to use and understand. Fuels rollbacks are one of the easiest: rewards members save on every gallon of fuel they purchase. With a points program, make sure the rewards line up with a reasonable spend amount to earn a reward. Customers get turned off by programs where it takes them too long to earn any benefits on a reward program. The same is true for clubs. When considering how many coffees a customer has to buy to earn a free one, consider the overall average transaction amount you'll gain by giving away the free coffee. Most free club redemptions include other purchases. A club that gets shoppers to keep choosing your store for frequent purchases is a successful club! Research shows that no one likes carrying rewards cards and key tags. In fact, a 2017 CodeBroker Loyalty Reprt shows that 43% of loyalty members say carrying a card is their #1 pain point. Our most successful programs allow customers to enroll by simply texting a word or phrase to a special short code and the member is immediately enrolled. Downloading our app is just as simple with a download link sent via text. Having a program tied to a users cell phone ensures they always have access and will be more likely to use it and stay engaged. This saves you thousands of dollars on plastic cards that never get used anyway. Even more importantly, customers respond to text offers six times more often than email promo offers. Having an app along with specific targeted text offers will drive traffic and increase basket size. Loyalty program users are accustomed to using an app to track rewards and get offers. The ease of having the program all in one place with easy access is a huge benefit. Frontline employees will make or break your program. Do not launch or operate a program without proper training and full buy-in from your frontline staff. Train them on process, provide cheat-sheets for enrolling and engaging customers, inform them on how the program helps them and the company, and reward them for good behavior. This is by far your best investment dollar for a rewards program. A key part of Tecmark's onboarding process is providing clients with a training roadmap for your employees. Create for yourself measures for success other than just number of members or ROI. Consider measuring things like rewards member transactions vs non-member transactions, promotional response rates, and redemption rates. Using the data you gain from members in the rewards program is key in optimizing your program over time. Let the data inform your future business decisions for your c-store. There are many ways to keep a program simple and cost effective, but it requires some thoughtful planning and understanding of you and your customers' needs. See how a Tecmark rewards program will help you drive more traffic to your store and increase profits.